On this tonight’s episode Deb got it into her head that she has to confess to LaGuerta’s murder to clear her conscious, oh crap…. poor Dexter… Deb just got worse and worse tonight and finally confessed to Quinn that she killed LaGuerta. Quinn called Dexter to get him to help, Deb was at the police station. Dr. Vogel more or less tells Dexter it might be better to leave Deb confess. Dexter tells Dr. Vogel no way, so they head to the station to get Deb. Dr. Vogel tells Quinn Deb is suffering from PTSD because she feels guilty about LaGuerta’s death. He tells them to take Deb home. 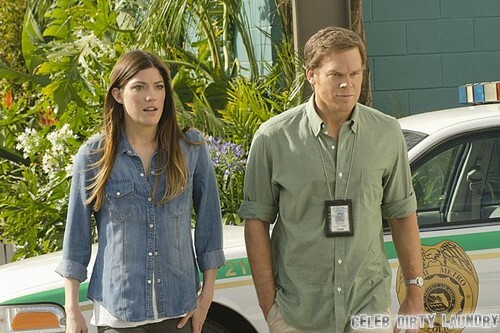 Dexter enlists Dr. Vogel to help him with Debra. He finally leaves Deb handcuffed with Dr. Vogel and heads off to do another kill. Did you watch tonight’s episode, so much happened, if you missed it, head over to our detailed recap and get caught up, click here. On next week’s show we are going to see Deb and Dexter working together again or so it seems from the pictures released. Deb asks Dr. Vogel about Harry and Dexter. Dr. Vogel tells Deb that Harry had doubts about Dexter. Although Dr. Vogel is treating Deb for PSTS she not handling Deb with kid gloves. She accuses Deb of killing an innocent women for simply doing her job. When Deb mentions she did it because of Dexter, Dr. Vogel tells her that Dexter cannot help what he is, he has no conscious. Deb questions whether Harry killed himself and asks Dexter as much. Dexter is still pursuing Dr. Vogel’s list of serial killers. Dexter has become Dr. Vogel’s hero. Quinn overhears some men laughing about Debra. Apparently they saw Deb passed out drunk and they found it amusing. Quinn did not and comes to Deb’s defense by going after the men. It seems Quinn still has a thing for Deb. Dexter finds notes that Dr. Vogel has been keeping about him and starts to suspect that perhaps he is the subject of her next book. He confronts Vogel about it, he feels he is nothing but a lab rat to her. He tells her she is out of her life, it’s over. Dexter episode 4, “Scar Tissue” airs on Showtime on July 21st, 2012. Check out the preview video and some pictures below of episode 4and let us know in the comments below what you think! Are you enjoying season 8 of Dexter?